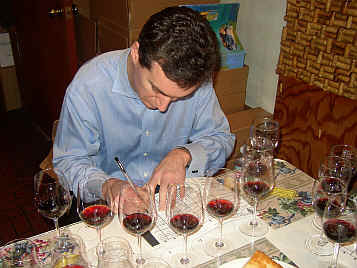 The 1998 Brunello di Montalcino wines have received modest attention from the wine media, being over-shadowed by the 1997 vintage. The summer of 1998 was rather dry in Montalcino and there was a rather intense heat wave in late July and early August. These factors generally translated into smaller fruit and less foliage. Given these factors, the challenge for winemakers is how they handled the somewhat unusual skins-to-juice ratio. We assembled a fairly representative set of wines to gain a sense of the vintage. One wine finished significantly ahead of the group and one wine significantly behind. 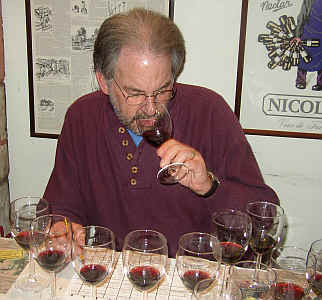 Six of the eight wines had at least one last place vote and six also had at least one first place nomination. Most of the comments regarding this wine centered on its lack of character. The winery may lay claim to having "invented" Brunello di Montalcino, but its rendition doesn't offer much more than a "spaghetti red" Chianti. One taster felt "It was unlike the rest of the wine in that it was more like a Chianti." Other comments included terms such as "simple wine with charm, but it didn't belong in this tasting," "light," "watery and medicinal" and "this is a mean little sucker." My notes were along the same lines. The wine is not much more interesting than a good $10 Sangiovese and it's simply a shallow red. The fact that Biondi-Santi is not more widely criticized by those who assign numerical scores to wines makes this taster wonder "what's up with that?" I am sure some may defend Biondi-Santi, claiming the wine needs a decade (or more) to show its stuff. If that's true, they ought to consider not releasing the wine until it IS showing itself as something worthy of purchase. "This wine is short, nasty and lacks fruit." 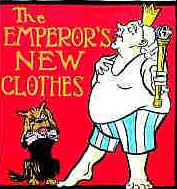 opined one critic. Another felt the fruit was "almost unripe." Someone else found it, also, to be "green and showing green tea notes. Maybe it's 'closed down' and does have decent fruit?" A third taster felt it was "one dimensional and really grippy and tannic, not to mention herbaceous." A final critic found it to be displaying "weedy notes." What others were finding as "green" or "weedy," I described as being reminiscent of eucalyptus. This is not an unusual character for Brunello. I found the wine to be a bit light, but certainly well-balanced and well-structured for five to eight years of cellaring. I gave it a one star rating on my three star scale, no stars being a standard or ordinary wine. 6th Place: ANGELINI 1998 BRUNELLO DI MONTALCINO "VIGNA SPUNTALI"
One person found this to be a substantial wine, characterizing it as "chewy." Another said it's "Sharp and sour and it got worse as it sat in the glass." But someone else felt it "blossomed in the glass, but it's simply harsher than the rest of the wines." Many of the other comments regarding this wine sounded the theme of it being "tart," "too acidic," and "green tannins." But a few people were more positive, one person finding "Nice Sangiovese and meaty fruit notes," while another taster said "It's nicely balanced, with plenty of fruit...a classic!" A final critic encountered "Crushed strawberry notes, blueberry-like fruit and it's very acidic." I was enchanted by the ripe, sweet nature of the fruit with the wine showing itself as a "modern" wine without being all oaked up. This was intense, youthful and had good length on the palate. It ought to age nicely, too. I gave it two stars. 5th Place: CASTELLO BANFI 1998 BRUNELLO DI MONTALCINO "POGGIO ALLE MURA"
One critic nailed this for "not having much complexity." Another felt "it opened slowly and was soft, overall." Someone else described it as having "nice cherry fruit with a bit of vegetation. It's bitter and tannic at first, too." A fourth person felt it was "bland on the nose and it's acidic and bitter." Another person found it "more over-ripe and dried out, with citric and metallic notes." A final comment was that it's "weedy and straw like in character." I found this to display a note of eucalyptus, much like its stable-mate. I found it big and fat and fairly rich on the palate with nice length. I like it marginally better than Banfi's regular bottling, but the structure suggests about the same five-to-eight years of cellaring. I also gave it a one star rating. "This is nice, but extremely tannic." said one tasting participant. 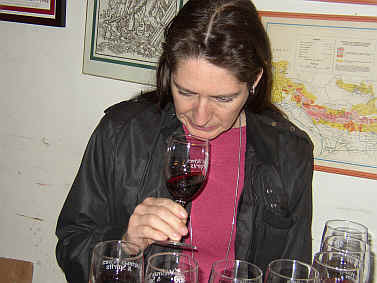 Another person found it "Age-worthy and it had the best nose at first, but I didn't like its finish on the palate." Someone else detected "Butterscotch on the nose and coffee grounds in the mouth." A fourth critic said it was "metallic." A fifth found it to be "Exotic and evolved...quite in a different league from the rest. It's really well-balanced and a top wine, being the most complex and well-polished." I agreed with the notion of exotic. It's really showing a wonderfully cherryish fruit character along with some earthy tones and brown spice notes such as nutmeg. While the same features come through on the palate, the wine is a bit tannic and leathery and shows itself to be an "important" wine. Really nice for my tastes! Two-and-a-half stars. 3rd Place: TENUTE SILVIO NARDI 1998 BRUNELLO DI MONTALCINO "Vigneto Manachiara"
One critic disliked this wine, interpreting the aromas as being reminiscent of "...burnt rubber and it tasted like rubber!" Another detractor found the same "rubber" notes and added adjectives such as "burnt toast, fruity and earthy" to the list. Someone else, more positively, proclaimed this to have "all the fruit in the world. It's elegant and complex." Another taster found it to show "dark berry fruits and hints of spice with a very long finish." Another fan said it's "got great berry-like fruit and a nice tart quality, with an acidic, lengthy finish." A few other people noted the elevated acidity here (this usually bodes well for long aging). A final critic felt it was "more extracted than it was concentrated." I pegged it as a really good example of "old world" or "traditionally-made" Brunello. The wine displays some youthful elements, but there's a note of maturity here, too. I figure the tannin should allow it to go 10 or 15 more years, but I wonder whether or not there's enough "grape" to be cellared for that amount of time. Still, I gave it a one-and-a-half star rating. 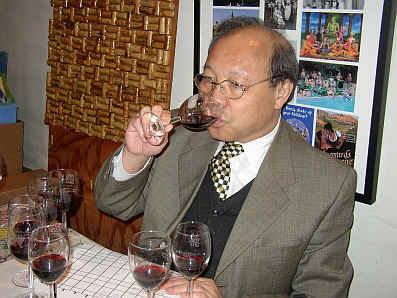 "This is big, dark with lots of black fruit and a hint of tobacco. It sports a long, smooth finish, too, and is the most complex. It's the only wine of the set which I'd buy." said one taster. Another person found "violets and it's really full and has a fair bit of glycerine, mocha notes and a long finish." A third panel member found it to show an "exotic nose that is quite different. It's not in character with the rest of the field. But there are a lot of things going on here...including a sort of feral, wild nose." Someone else found "tomato-like" elements here, while another critic found it "sour and citric." The nose of this wine, for me, was really different. It showed a lot of black fruit aromas, but also a note somewhat along the lines of wines fermented with a percentage of whole, uncrushed berries. A bit of eucalyptus shows up and it's deep and rich on the palate. There's a mildly jammy quality on the palate. Big, showy and needing a bit of cellaring to smooth the tannins. I gave it two stars. 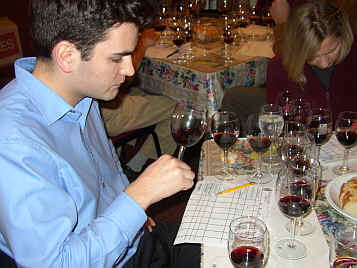 1st Place: PIEVE SANTA RESTITUTA 1998 BRUNELLO DI MONTALCINO "Rennina"
Though the tasters were largely positive about this wine, one critic likened it to being "the Silver Oak of Brunello as tasting it resembles chewing on a barrel." A second person remarked "I wanted to NOT like this, but it's remarkably elegant and displays good fruit." Bob said it was just like a Spanish Rioja wine with all that oak. Another tasting participant said it's "got lots of cedary oak and is more harmonious than most of the other wines. There's a nice cherry quality to the fruit, too." 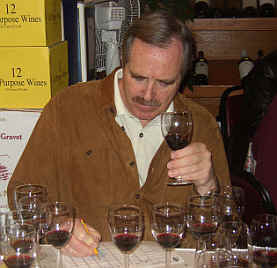 A final critic felt "it didn't have as much body as the other wines." I found the nose to be quite cedary and woodsy. The same notes are intense on the palate, with vanillin and cedar tones. It is big, "important" and showy. I suspect this will live a long time, too, as it has good acidity and structure for a decade or more of aging. Two stars.